To avoid the risk of steep penalties, immediate measures should be taken to ensure I-9 documentation is compliant. Plus, it’s crucial to know your rights and obligations should an investigator come calling. Shanna Wall, Esq., Compliance Attorney, answer the most important questions about increased I-9 enforcement. The I-9 form was last changed on November 14, 2016. That’s when the new form was released. On the form you will see the date 11/14/2016, and you’ll also see the expiration date of 8/21/2019. Seeing both of those dates on the form will guarantee that you’re using the most up-to-date form. You want to make sure you’re using the most up-to-date form, because that law did go into effect as of January 22, 2017, so everyone across the US that is hiring employees should be using that form. When there is a change that occurs by the government, do we have to have employees fill out a new I-9 form each time it’s changed? You want to first make sure you are using the most recent form. And, as I mentioned, it was changed on November 14, 2016, and those changes did go into effect January 22, 2017. You could have been using the old form up until January 22 and that is completely valid; however, as of January 22, you must have any new hire from that point on use the new form. If you have employees up until January 22 filling out the old form, and all of your previous employees then that’s fine, you don’t need to have all of your employees who filled out the old form fill out a new form. We will go into more questions about corrections and all that kind of stuff because that can actually affect changes you’ll need to make or things you need to do if you happen to file the wrong form, or filed an expired form when it should have been a more current form. 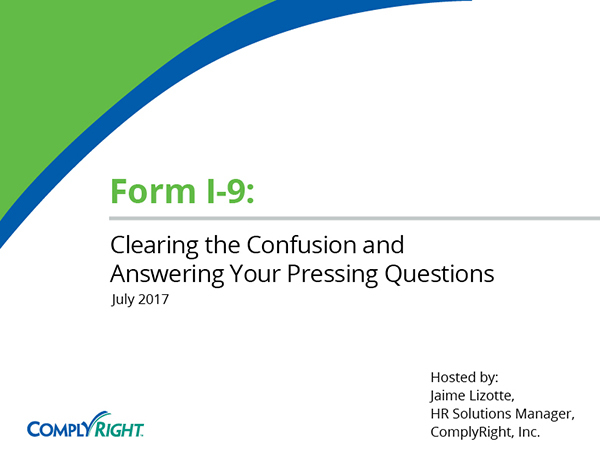 Do I need to complete an I-9 for every employee? This answer can be a little bit confusing because my first answer to you is yes, with very limited exceptions. In general, you must complete and retain a Form I-9 for every employee you hire in the US. The I-9 is used to show employees authorization to work in the US, and employees you’re going to hire must fill out that form that you’re going to hire in your company, regardless of the employee’s citizenship or national origin. This does include a business owner. If you own the business and you are the only employee, meaning that you are paying yourself or you’re receiving some form of other remuneration, you still need to have a form I-9 filed for yourself, just in case of an audit. You want to make sure you have that documentation filled out completely and accurately. However, I mentioned you need to have an I-9 for every employee with limited exceptions, and those limited exceptions come into play here. You do not need to complete an I-9 form for employees who were hired on or before November 6, 1986, as long as you’ve employed them continuously since. November 6, 1986, is actually the original date that the I-9 form first came out and that’s when it was established. If you’ve employed somebody from 1986 since, then you don’t need to have an I-9 for them; however, if that employee started back in 1986 but previously left your company for whatever reason and came back, then yes, you must have an I-9 for them. You do not need to complete an I-9 form for independent contractors. You also don’t need to have an I-9 for workers from a temp agency. The temp agency will actually take care of that work, because they’re the ones who are making sure the people who are working with the temp agency are authorized to work, and they need to make sure those people are authorized when they provide them to you, to work in your company. You also don’t have to have employees complete an I-9 for workers who provide occasional domestic services in a private home, a housekeeper, a babysitter and positions like that. The last thing I want to mention is that we had a lot of questions come in about volunteers. Volunteer workers do not need an I-9 as long as they’re not receiving any form of pay or other remuneration such as housing expenses. Whatever form of pay you may be providing to them, if they’re receiving some form of remuneration, in regard to any sort of work they’re doing for you, volunteer or not, then you must have an I-9 for them, but if they’re not receiving anything from you, you don’t need an I-9. Remember, even if you’ve known the person for years and years and you know 100% in your mind that they are a US citizen, you still have to have them fill out an I-9 if they’re going to be employed in your company. 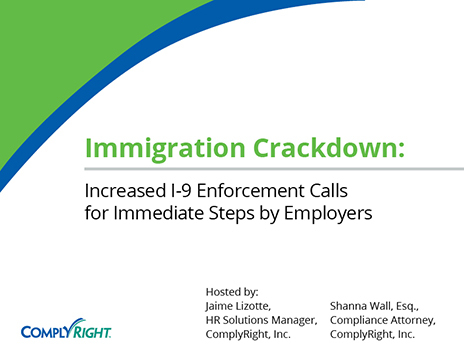 When do employees need to fill out a Form I-9? Employees need to complete Section 1 of the Form I-9 on the very first day of work, and you need to review the documents presented by the employees, which allow you to establish their identity and their eligibility to work in the United States. So, on day one, the employee needs to fill out Section 1 and also provide documentation from list A or combination of a document from list B and list C. Then, you as the employer have the next three days to record the required information about these documents and fill out Section 2 accurately. On day one, the employee fills out Section 1 and provides a document to you as the employer, and then you have three days to finish up that form and have it filed. For instance, if you have an employee who starts on Monday, they must have Section 1 filled out and documents provided to you, and then you have until Thursday of that business week to record the document and finish completing Section 2 and then get that form filed away. When we’re talking about employees who need to fill out an I-9 form and what you need to keep, what if I have an employee who only works for one day? So they started in your company, they only worked Monday and they’re no longer working there. You still have to pay them for that one day they worked, right? You’re obligated to show that even the one day they worked in your company they were authorized to work in the US. If you issued them pay for the time they worked, then you’re responsible for making sure they were authorized, and you must have an I-9 on file for them. In this case, with your recordkeeping requirements, you would have to keep that form for one year from the date they left. If they started on Monday and that was the only day they worked, you’d have to keep that for the following year, and then you’d be able to discard it. I hope that clears up a lot of the confusion about what the current form is we’re using, as well as who needs to file an I-9 and when the form need to be filed. A lot of people think making photocopies of documents is a requirement, that it’s a law, and some businesses do it, and some businesses don’t. We want to clear up that confusion so I’m going to turn this over to you, Shanna, because, when it comes to documentation, depending on what you’re doing, can get you into some legal hot water. I mentioned that this is a topic of debate for companies and even immigration attorneys on what they advise is best practice. Like Jaime said, it’s not required, so you can keep copies of what is presented to you for verification, or you don’t have to. Unless you’re 100% confident in your accuracy, then I would not keep them, because it’s not required. If you do keep photocopies then you need to be consistent across the board and keep them for all of your employees. The question that came up said, "We didn’t keep copies for the longest time, but now we want to start keeping copies, so do I have to actually go back in time and get copies from employees who have been employed with the company for years?" The answer is, you don’t have to go back, but from whatever date you decide to start, then going forward you need to be consistent. Say you’re going to start collecting photocopies of those documents today; you want to do that for any employee who’s hired from today on. It’s just a matter of consistency, so no, you don’t have to go back to employees who have been working there for 20 years and get their documents. Just keep it consistent. If an employee is handing you documents from either list A or list B and list C, can you require which ones you request specifically? You don’t want to ask for specific documents. If they choose to give you their Social Security card because they’re doing a list B and list C then that’s one thing, but if they choose to do an item from list A, for example, then you would not want to request that. You only want to get what’s required, nothing more, nothing less. Keep in mind that the Social Security number isn’t required to be filled out in Section 1; it’s voluntary, unless you’re a company that chooses to use E-Verify. If you use E-Verify then the Social Security number is no longer voluntary. Only ask to see what’s required, and don’t specifically force them to show you a certain document. Where do I keep the documentation for the I-9 forms? Can I keep it in the same folder? Do I have to keep it in separate folders? There are a lot of myths out there that say it’s a legal requirement that you must keep them in separate folders. There is no legal requirement for you to keep the I-9 forms in a separate folder. They can be kept in the same file folder with all your other employee information such as the personal information, the hire date and their pay. However, you can also keep it in a separate folder, and a lot of businesses that we find actually choose to keep it in a separate folder, preferably a binder with tabs where the forms are sorted by employee because it makes it easier for them when conducting a self-audit, because then they know which ones they checked. They can just go through and check by employee, which is much easier and will take less time, and decreases the readiness time in preparation for an audit. If you get that unexpected knock on the door, and even though you do have time to say, "Listen, I need you guys to come back" and you have that three day window, you’re not necessarily going to need as much time to gather everything. Now you’re trying to pull out the I-9s from all of the folders and then put them in one, but this way you can just jump right into your self-audit make sure everything’s good to go. Then you can present that binder to the investigator, and everything will be right there so the answer here is: There is no legal requirement; you can keep it in the employee personnel folder, or you can keep it separate. It’s really whatever pertains to your business and whatever you feel is best for your company. We had a lot of questions on reverification, such as: “I reverify every time an employee’s driver’s license expires” or “I reverify every time that they change their address.” You want to make sure you’re not overdoing and making more work for yourself when it comes to the job, because obviously, depending on how many employees you have in your company, you could be constantly working on I-9s all day, every day. We’re going to answer a couple questions here when it comes to reverification and again, that has to do with the forms you have to reverify, making sure which form you have to reverify and so forth. Shanna, can you expand upon that for us? Every time you do additional steps that you don’t need to do, you’re setting yourself up to make mistakes. 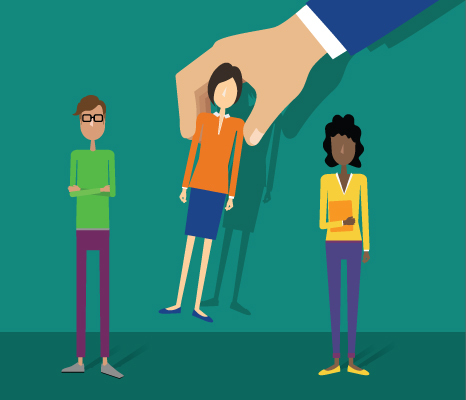 You can set yourself up even for discrimination claims, especially when it comes to reverification, because a specific group of people might feel targeted. So it’s important to be consistent with it. Now, there are only some documents that actually need reverification. Typically that would be only list A documents such as your employment authorization document form. You’ll see that on list A. I believe it’s number 4 down on list A. That’s one that, when it expires, you have to reverify. Also, you want to set yourself up with something that’s going to notify you about 90 days ahead of time so you can give your employee that amount of time to make sure they’re getting their ducks in a row; that way they can provide you the documentation needed to reverify in time. Go ahead and set up a tickler; that’s your best-practice advice here. But as far as for your U.S. citizens and noncitizen nationals, you don’t have to reverify them. Even if documents, especially on list B, have an expiration date, you don’t have to reverify those. That would be like your driver’s license or a state-issued ID card and again, as I said, not all of list A needs to be reverified either. For example, your US passport, that has an expiration date, but you don’t have to re-verify that document. To restate this again, you don’t need to reverify everything. You only have certain documents, and it won’t be any from list B that you need to reverify, and also, you don’t need to reverify US citizens or noncitizen nationals as a general rule. I hope we are saving some time in your daily duties when you’re dealing with I-9s because if you’re looking to go back constantly and you have reminders in your mail set up in your calendar to reverify driver’s license as people’s licenses change or their addresses change, you must make sure you understand the I-9 rules and regulations. It’s very important, because that time can add up to where you’re spending time on things you don’t need to do, possibly putting your company in potential legal hot water. Is it recommended to get an attorney if ICE investigates your business? It’s really going to be case-by-case specific. It’s going to depend on your company’s needs and resources. So it’s really hard for me to say yes, absolutely, or no, absolutely not. Of course, I’m always going to advise that it’s best to get an attorney involved. You definitely want to take all factors into consideration, such as how confident you are in your I-9 processes and what potential exposure do you have to penalties. Those are the kind of factors you want to take into consideration when you’re trying to determine when or if you should even get an attorney. We were doing some audits and we found that we had a few employees who didn’t have an I-9 on file who should’ve or we were looking at our old I-9s and there were complete sections that weren’t filled in at all. What do we do? The first thing I want to recommend, because this can get specific as to which boat you fall into here, you can always go to the government’s website on to find answers on this, UCIS.gov, which has a lot of resources there. They’ve got a handbook for employers, and they’ve got lots of FAQ pages that you can look through as well. So, for example, if your employees are missing complete forms because you didn’t fill out a form for them and you should have, then you can just go ahead and fill out the current form for these employees. You never want to back date anything, so on the current form you’re still going to put their date of hire in. You have to certify that, but don’t back date it to when they were hired. Whenever you sign it, you’re going to sign and date it the date you are filling out the form, but attach some kind of explanation to it. For example, doing a self-audit didn’t have a form, so now sign and date and attach that. If you’re just missing a section, for example, but you have the old form, we’re presuming the form you do have was current at the time of their hire, then you can go ahead and just complete that section on that old form. Keep in mind, if it’s section 1, the employee has to fill it out. You can’t fill it out for them just like they would on a current form. If it’s section 2 or 3, then you can fill that out as the employer, but again, never back date anything and make sure that you attach an explanation that’s signed and dated. Let’s say, for example, you realize that you actually used the wrong version when that employee was hired and so what do you do then? You want to make sure the documents you were provided and used to fill out the form were the ones that met the specifications at the time of the form you should have used. There’s a couple different things you can do, and again, all this information is on the website, you can just pull it up from there, but you can staple the outdated form with a current form and put in an explanation as to what happened. Just make sure that, once you staple the current blank form to the already-filled-out old version, just sign and date that old form, and add an explanation of why that situation happened and that you filled out the form in good faith and the documents were up to date as of that form. Right, and again, as I said, you can look at the USCIS government site to get more information on this, but generally those are some of the things you can do to correct things when you’re doing your self-audit. ComplyRight also offers a self-audit correction form and, as we’ve mentioned, when you have a correction, you have to attach a statement of why that was changed, and those self-audit correction forms that are offered at ComplyRight you can find at HRDirect.com. They provide that documentation, so you could just take that self-audit, go through it, and all you have to do is staple it to the back of the form and you’re good to go, because that satisfies as meeting a requirement for changes in your self-audit.